Skirt steak is the diaphragm of the beef, a long very stringy cut of meat that accounts for the name of the dish (trans. "sashes"). It used to be dirt cheap, and was poor folks fare until the food faddists discovered it. (Depending on where you live, this cut may either be easily found at your market, or require a special order with the butcher. In a pinch, you could substitute flank steak.) To be tender, the meat demands VERY careful handling. Arm yourself with a small, sharp knife, and obsessively trim off ALL the fat, and as much of the silvery membrane surrounding the exterior of the meat as you can manage. This can take a while, but be persistent. The more you trim, the better the finished product. Place the meat in a deep non-metallic pan, and cover in the mixture of the cup of Beer, 1/2 tsp. Liquid smoke, juice of 2 limes, 2 tbs Worcestershire sauce, 1 tbs Soy sauce, and a pinch of Cumin and Mexican oregano, black or lemon Pepper and Garlic powder. Marinate the meat, turning occasionally for at least 2 hours (overnight is better). When the exterior of the meat is gray, it's ready to cook. The soy is NOT authentic, but since Ninfa's, the Tex-Mex restaurant chain that originally popularized the dish uses it in THEIR marinade, I sometimes do, too. It gives the finished dish a nice shiny glaze. To cook, fish the meat out of the marinade, and dry well. Season the exterior with a liberal quantity of cracked black pepper (lemon pepper is good, too), and garlic powder (not salt). Grill over a medium-hot charcoal fire (best), or broil or grill indoors. Either way, be VERY careful not to overcook the meat. If you cook skirt steak beyond medium rare, it will be the toughest cut of meat imaginable. Since the steak itself is quite thin, cooking time will be brief. To serve, cut into thin, slanting slices, carving against the grain of the meat. Meat: 2 or 3 sections (3 or 4 pounds?) Fresh cured (preferably NOT pre-frozen) lean Beef skirt steaks. Prep skirts by cross cutting the striated membrane. 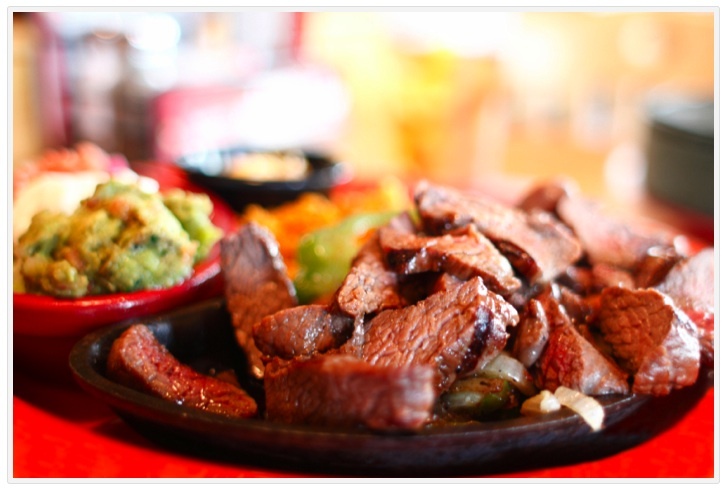 Remove the "excess" parts as much as possible or fajitas will be rubbery & tough. In 2 quart bowl combine crushed garlic (you can save 1 crushed section and "smear" it over the steaks if you like it "more" garlicky or you cook your Fajitas well done). Pour in the Lea & Perrins, add brown sugar, thyme, (and optional). Squeeze in the limes; include some of the rind oils. and throw the sections in the liquid, crush a few sprigs of the cilantro (less the stems) on the edge of the bowl and grind the rest of the leaves 2 tsp. TOTAL into the liquid through your fingers to get the "taste" in. Pour the liquid over the skirts and make sure the meat is ALL covered. (you can add some water but don't get carried away) Cover with Saran wrap and let chill overnight if possible. 1 hr or 2 before you cook the Fajitas let the meat in the marinate come up to room temperature. Start charcoal fire and wait till glowing (use mesquite charcoal if you can get it; use wood charcoal not briquettes. Soak some 1/2" dry mesquite wood strips 6" long in warm water for 20 minutes before cooking. When fire is HOTTEST place 3 or 4 mesquite strips on fire and begin grilling the Fajitas. Keep covered to "smoke" them good and keep spraying the strips to keep them from burning and to continue smoking them. Baste the Fajitas once on each side before turning in the marinade to keep up the flavor. Fajitas are best medium with a good "char" on the surface. If you smoke them right they'll be BLUE 1/8" into the surface of the meat. Keep adding strips, as they burn (you can't stop them, so don't try, just use water. When the Fajitas are done, quickly chop them up with a chef's knife (across grain) in 1/2 " sections and serve with salsa and beans in tortillas. Mix together gently, making as much as needed but to every Pint add 2 tbsp. olive oil and then squeeze 1 lime "over" the top and as the lime "fractures" the oil (it works like a "salad dressing") carefully stir, cover and immediately refrigerate until used. Let come near room temperature before eating. Use either canned beans or prepared dry Pinto Beans. Sauté garlic and onion in PORK FAT in sauce pan until tender, add cumin powder & "fresh" cilantro leaves (to taste) with water and simmer ALL day adding water as needed. Add a smidgin' of chili powder or fresh chopped green pepper after the sauté. Note: you may want to omit the cumin, if you included in the fajitas marinade. Let guests make their own fajitas. Layer 1/2 c.meat, 2 Tbs. Beans and 1/2 Tbs salsa on a freshly steamed flour tortilla. Roll tortilla. Serve with Tres Equis Beer w/ lime. Slice steak into thin 1 1/2 inch strips and place in a glass utility dish. Combine marinade ingredients and and pour over steak. Sprinkle with chili powder. Cover and refrigerate overnight. Thread meat onto skewers and grill untill medium-rare. Serve on folded tortillas with salsa, etc. Rub the meat with the garlic and place in a shallow dish. Mix the tequila, lime juice, orange juice, vinegar, orange zest, black pepper, chili powder, salt, worcestershire or soy sauce and brown sugar, add the oil and mix well. Pour over meat, basting well. Add the cilantro to both sides of the meat. Cover and marinate 2 to 4 hours (don't overmarinate or the meat will "cook" in the acid,) turning occasionally. Remove meat from marinade and brush excess marinade off meat so that it doesn't steam when grilled and so that the cilantro doesn't burn on the grill. Grill meat on hot coals approximately 3 to 4 minutes per side (slightly longer for flank steak) or broil in a preheated oven 6 inches from the flame -- grilling is much more authentic and is highly recommended. Do NOT cook too long. This cut is good only rare to medium rare; it is shoe leather if cooked beyond medium. Let stand 5 minutes before serving. Cut meat at a sharp angle (almost parallel to cutting board) across the grain and serve with flour tortillas, guacamole, salsa, sour cream and grilled vegetables like green or yellow onions and bell or poblano peppers and fresh chopped cilantro. Maddie and Young Bruce made shrimp fajitas on Wed March 10, 2010. So everyone would be happy, they served chicken and steak too accompanied peppers and onions and mango salsa. Heat 1 tablespoon of oil in a large skillet over medium-high heat. Add the red and green bell peppers, and onion. Cook, stirring frequently until peppers are hot, but still slightly crisp, about 5 minutes. Remove from the skillet and set aside. Pour the remaining 1/2 tablespoon of oil into the skillet, and add the shrimp. Cook, stirring occasionally, until pink and opaque. Reduce heat to low, and return the peppers and onion to the skillet. Stir in taco seasoning and water so that everything is evenly coated. Simmer until peppers are heated. Serve in warm tortillas. Chicken fajita rollups are made with marinated chicken. try a southwest or fajita type marinade to achieve the packaged chicken they have at Applebees. the pico is just cilantro, onion, jalepeños, and tomatoes, finely chopped. a jack cheese/american blend is what they use. also, at Applebees, they just put the cheese on the tortilla, add chicken, and microwave. then they add the pico and lettuce and roll. the dipping sauce is simply a mix of salsa and ranch dressing. (less salsa than ranch.) I used to work there, and have made this many times. it is very simple to make. Grease the bottom of a round baking sheet. Place your tortilla shell on the sheet. Place all hot ingredients ingredients on top and put in your broiler long enough to melt the cheese. When you take out of the broiler add: 1/2 cup lettuce, 1/8 cup diced tomatoes and about an 1/8 cup sour cream. Pulse the onion and garlic in a food processor until finely chopped. Add the coriander, cumin, chipotles in adobo, brown sugar and oil, and pulse to combine thoroughly. The mixture should resemble a thick paste. Rub steak with the chipotle marinade and set aside for at least 30 minutes. Preheat grill. Season the meat with salt and pepper and sprinkle with lime juice. Grill to medium-rare over high heat, about 1 minute per side. Remove from the grill and cut into strips with the grain of the meat. Lightly toast tortillas over a flame. Top tortillas with meat strips and serve with guacamole. Recipes come from some of the state's top chefs, including Mark Miller of Coyote Cafe. Some contributors are better known outside the kitchen, such as New Mexico Gov. Bill Richardson, who offers his recipe for homemade tortillas. Some of the dishes, while no doubt available in the Land of Enchantment, don't exactly scream New Mexico. Witness Caprese Bruschetta, Thai Chicken Wings and Hungarian Goulash. But there's plenty of local flavor, as in the Red Chile Chocolate-Chip Cookies. Not to mention all that art.